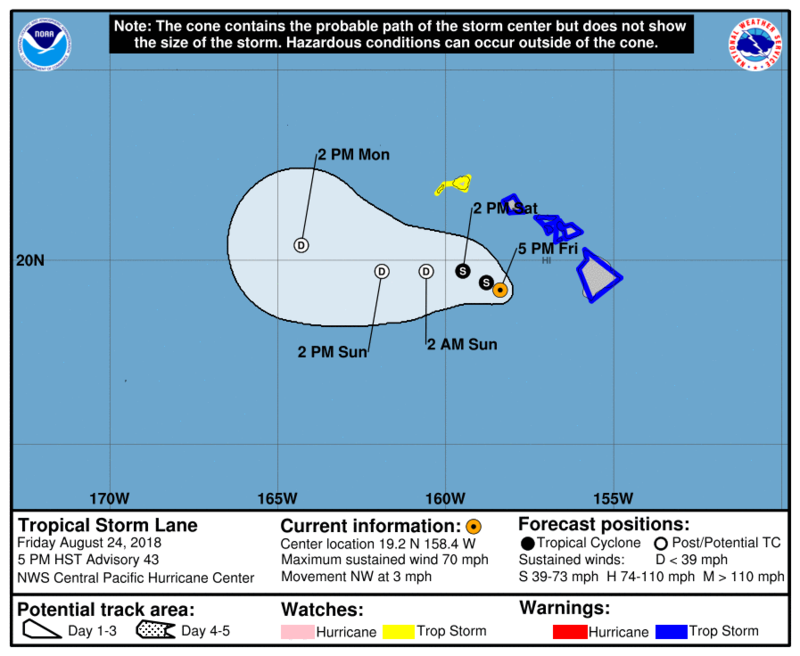 Hurricane Lane downgraded to a tropical storm at 5 PM on Friday August 24. Threat of heavy rain and flooding still significant. Please see this page for updates on the storm by your Honolulu-Pacific Federal Executive Board. At 5:00 PM on Friday August 24, Hurricane Lane weakened to a tropical storm south of the island of Oahu, but rain bands will still bring more flooding and damaging winds to parts of the Hawaiian Islands. On the forecast track, the center of Lane will pass south of Kauai on Saturday. A tropical storm warning is in effect for Hawaii, Honolulu and Maui counties. A tropical storm watch is in effect for the island of Kauai. A flash flood watch remains in effect for all islands. Remnant ocean swells will produce high surf along exposed south and east shorelines through Saturday. Continue to monitor local sources and forecasts for potential effects from Lane's passage, as well as for school, commute and work force status on Monday 27 August. Agency and employee status during approach and passage of LANE is at agency head discretion. The HPFEB recommends that federal agencies consider early release of employees on Thursday 23 August 2018, with liberal administrative leave/telework. The HPFEB recommends that employees, with the exception of supervisor directed emergency management personnel be placed in an administrative leave/telework status and not attempt to come to their workplace on Friday 24 August 2018. The most significant threat from Hurricane LANE remains potentially life threatening flash flooding, and some significant surf/surge and coastal inundation, particularly on the south shore of Oahu. The designated official at the PJKK Federal Building has announced that the federal building and courthouse complex will be closed to the public commencing at 5 PM HST on Thursday 23 August 2018. The State of Hawaii has released non-essential employees on Thursday August 23, 2018 and Friday August 24, 2018. Public and private schools on Oahu will be closed on these dates. Workforce impacts for Monday August 27, 2018 will be assessed after LANE’s passage. Conditions from LANE are currently anticipated to affect Oahu from Friday evening through Sunday, with the possibility of continued rain through early the following week.